Now rescue work in Uttrakhand is by and large is over. The plight of pilgrims and tourists are some what known to country through media. but larger tragedy faced by the local population is not told so far. 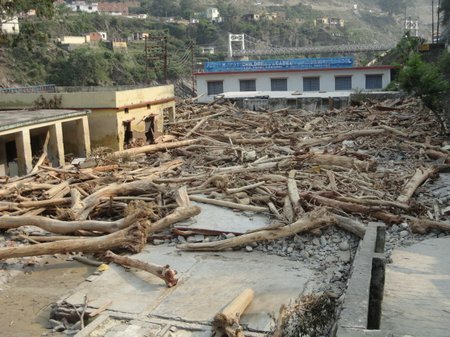 The calamity had struck a larger part of the state beyond Char Dham which remained in focus. I am not writing here to count the dead, let the Uttrakhand officials and government fight over it . But what is disturbing is the disrespect shown towards the dead by the state. The bodies are yet to be cremated , despite the PR exercise on cremation according to Shastras , this may be to score over the poster boy of Gujarat. There are civil organisations having expertise in post disaster disposal of dead bodies with respect such as Anand Marg, Ram krishan Mission, Gayatri Parivar and RSS there are many more they should be allowed to do their task. The national media’s have neglected the the plight of the small traders and workers who were in thousands in number to provide services to the pilgrims and tourists, from the villages of state and from neighbor states. The media not reported on the fate of the these people — almost all male — who come to earn a major part of their families’ annual income on the yatra routes during the yatra season. Local residents tell of village after village in the Mandakini valley below Kedarnath resounding with wails from homes whose boys and men have not yet returned and are now feared dead. One village near Guptkashi alone counts 78 missing. Now, the yatra season closed for this year and if we believe the officials will not resume for few more years, given the extent of destruction of infrastructure, communication links. The lives of these families will be more difficult. This may also increase the human trafficking for survival. We hope that the government will take steps to provide them alternative sources of income.